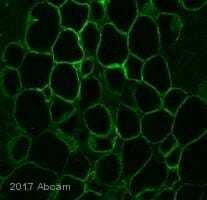 Rabbit polyclonal Perilipin-1 antibody. Validated in WB, IHC, Flow Cyt, ICC/IF and tested in Mouse, Rat, Cow, Dog, Human, Rhesus monkey. Cited in 40 publication(s). Independently reviewed in 8 review(s). Synthetic peptide corresponding to Rat Perilipin-1 aa 502-517. Our Abpromise guarantee covers the use of ab3526 in the following tested applications. WB 1/1000 - 1/4000. Can be blocked with Perilipin-1 peptide (ab5009). By Western blot, this antibody detects an ~62 kDa protein representing Perilipin-1 from 3T3-L1 cell extract. Modulator of adipocyte lipid metabolism. 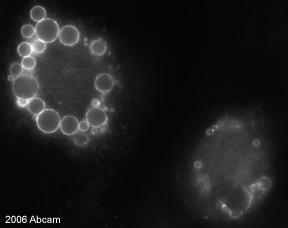 Coats lipid storage droplets to protect them from breakdown by hormone-sensitive lipase (HSL). Its absence may result in leanness. Belongs to the perilipin family. Major cAMP-dependent protein kinase-substrate in adipocytes, also dephosphorylated by PP1. When phosphorylated, may be maximally sensitive to HSL and when unphosphorylated, may play a role in the inhibition of lipolysis, by acting as a barrier in lipid droplet. Lipid droplet. Lipid droplet surface-associated. 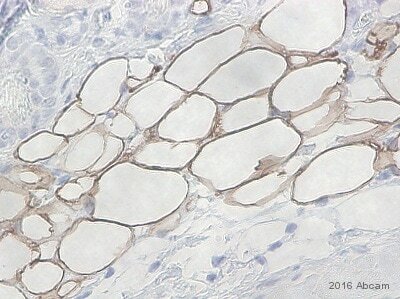 ab3526 staining Perilipin-1 in Mouse skin tissue sections by Immunohistochemistry (IHC-P - paraformaldehyde-fixed, paraffin-embedded sections). Tissue was fixed with formaldehyde and blocked with 3% serum for 30 minutes at 20°C; antigen retrieval was by heat mediation in an EDTA buffer. Samples were incubated with primary antibody (1/200 in PBS) for 12 hours at 4°C. 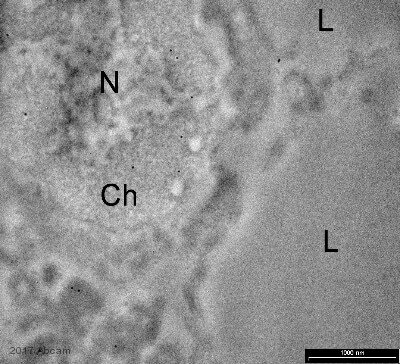 A HRP-conjugated Goat anti-rabbit polyclonal (1/200) was used as the secondary antibody. Western blot detection of Perilipin-1 in 3T3-L1 cell extract using ab3526. ab3526 staining Perilipin-1 in 3T3-L1 cells by ICC/IF (Immunocytochemistry/immunofluorescence). Cells were fixed with 4% paraformaldehyde, permeabilized with 0.1% Triton X-100 and blocked with 1% BSA for 1 hour at room temperature. Samples were incubated with primary antibody (2ug/ml in 0.1% BSA) for 3 hours at room temperature and labeled with Alexa Fluor® 488-conjugated Goat anti-rabbit IgG polyclonal was used as the secondary antibody (Green, panel A). Nuclei stained with DAPI (Blue, panel B), F-actin stained with Alexa Fluor® 555 rhodamine phalloidin (Red, panel C), merged images showing cytosolic localization (panel D). ab3526 staining Perilipin-1 in 3T3-L1 cells by Flow Cytometry. Cells were fixed with 70% ethanol, permeablized with 0.25% Triton X-100 and blocked with 5% BSA for 30 minutes at room temperature. The sample was incubated with the primary antibody (3-5 ug/million cells) for 2 hours at room temperature. 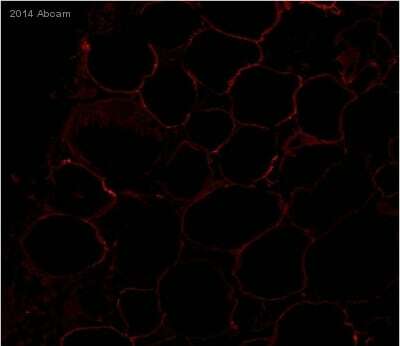 An Alexa Fluor® 488-conjugated Goat anti-rabbit was used as the secondary antibody (1:400), red histogram. Rabbit isotype control (pink histogram), unstained control (purple histogram) and no primary antibody control (green histogram). 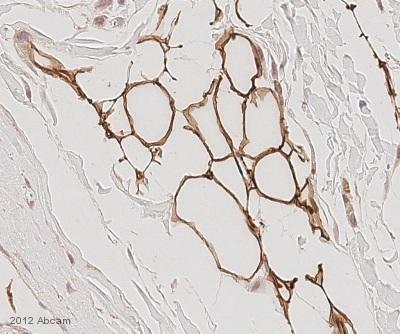 ab3526 (4µg/ml) staining Perilipin-1 in Human breast adipose using an automated system (DAKO Autostainer Plus). Using this protocol there is strong cytoplasmic staining of adipocytes. Immunocytochemistry/ Immunofluorescence - Anti-Perilipin-1 antibody (ab3526)Image from Stenson BM et al., J Biol Chem. 2011 Jan 7;286(1):370-9. doi: 10.1074/jbc.M110.179499. Epub 2010 Oct 28.; Fig 3.; January 7, 2011, The Journal of Biological Chemistry, 286, 370-379. Immunofluorescence analysis of Human preadipocytes, staining Perilipin-1 with ab3526. An Alexa Fluor® 568-conjugated anti-rabbit IgG was used as the secondary antibody. 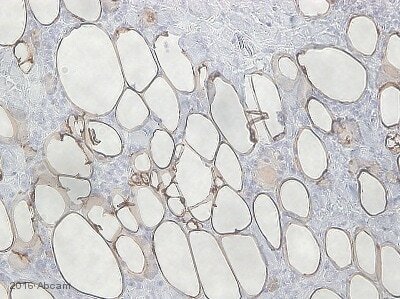 Immunohistochemical analysis of dog mammary adipose tissue, staining Perilipin-1 with ab3526. Tissue was fixed with formaldehyde and blocked with 1% blocking solution for 15 minutes at room temperature; antigen retrieval was by heat mediation in Tris-EDTA buffer (pH 9). Samples were incubated with primary antibody (1/200 in BSA in TBS) for 30 minutes. An undiluted HRP-conjugated goat anti-rabbit polyclonal IgG was used as the secondary antibody. Immunocytochemistry/ Immunofluorescence - Anti-Perilipin-1 antibody (ab3526)Image from Rossi CA et al, PLoS One. 2010 Jan 1;5(1):e8523, Fig 3.
ab3526 staining Perilipin-1 in rat myofibers by Immunohistochemistry (PFA fixed).Freshly isolated single myofibers were collected in 0.5 ml DMEM, 5% HS in an Eppendorf tube. Fibers and satellite cells were fixed with 4% paraformaldehyde in phosphate buffered saline, rinsed in PBS and permeabilized with Triton X-100, 0.5% in PBS. After washing, fibers and/or cells were incubated with ab3526 at a 1/50 dilution overnight at 4°C or 1 hour at 37°C. Non specific interactions were blocked with 20% goat serum. They were then washed and incubated with labeled secondary antibodies for one hour at room temperature. Satellite cells were then mounted with fluorescent mounting medium plus DAPI 100 ng/ml. Fibers were collected and moved onto a polilysine microscope slide, and then mounted. Publishing research using ab3526? Please let us know so that we can cite the reference in this datasheet. Thanks! I want to verify that the Expiration Date was written incorrectly. It should be March 27 2013, correct? Ypu are correct. The expiration is 27 March 2013. 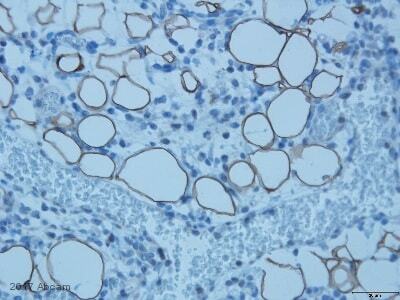 Hi, I would like to test ab3526 in IHC-P canine tissue. Thanks!